It’s not my first time working on microcontrollers and Ethernet interfaces, last time I’ve used an Arduino board with Ethernet shield for a voice control application. Now I have to build everything from scratch, and the target microcontroller is an atmega8, so the little program memory must be considered. 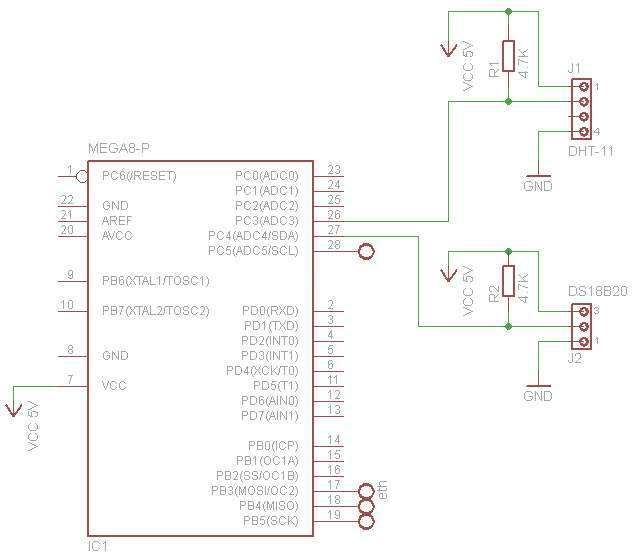 Here is how to use Atmega8 and enc28j60 together for an Ethernet capable application. My Atmega8 will use an external crystal, and run at 16MHz. It is connected to a 5V supply. The enc28J60 requires 3.3V. The two chips must communicate using the SPI interface. I found the original project posted on tuxgraphics . The solution is a good starting point, but it has lots of issues like: no buffering between the microcontroller and the Ethernet chip, microcontroller takes CLK signals from the Ethernet chip, not being able to run at various values, not a chance at 16MHz as I need it. There are numerous reports of issues caused by the voltage difference in the SPI link. I have decided to use a buffer, as indicated by Mirek, from Poland, here. He also sells ready made Ethernet boards that are extremely well built and will save you considerable time for such a project. When the 3.3V are applied and the network cable is connected, the two leds green and yellow should turn on from time to time. I bought two, and both refused to show any led activity. The boards were dead. Looking carefully I’ve noticed the crystals are soldered improperly and were shorting a few paths of the circuit. Correcting this, solved the problem and the boards were ready for use. The connector exposes CLKOUT, INT, WOL, SO, SI, SCK, CS, RESET, VCC and GND. I’m currently using only INT,SO,SI,SCK,CS, VCC and GND. The board takes 3.3V so make sure you use a regulator. Now you are ready to connect it to the Atmega8. SO goes to MISO, SI to MOSI, SCK to SCK, I have connected CS to PB2(SS/OC1B) and INT to PD2 (INT0). The software I’ve prepared for this article, comes with a minimalistic TCP/IP stack supporting IP, ARP, UDP and TCP, based on the original work of Guido Socher and released under GPL V2 license. I made it as a simple webserver, to open TCP port 80, so you can connect with your browser but you need to provide a few parameters: http://microcontroller_ip/?cmd=1 . In my sample I’ve used http://192.168.2.24/?cmd=1 , but you’ll need to change the code for a new IP that matches your network settings. The firmware replies to PINGs which are counted and displayed on the LCD and on the Atmega webpage. The webpage shows the number of times it has been accessed. For a simpler variant, you can skip the buffer and just connect the ENC28J60 module directly to the Atmega8. It will work well, especially if you don’t have other devices connected via SPI. The problem is the ENC28J60’s mini TCP/IP stack uses a lot of the Atmega8’s available flash memory. Aprox.6-7K out of 8K available. This leaves very little room for additional logic. More on temperature sensors here. Here is the very basic webserver implementation, featuring only the Ethernet interface, and the minimum software, that runs a local webserver. IP is configured as 192.168.2.24, so take that into account when building your own. Thanks for sharing! You saved me a lot of time: I’ve got exactly the same enc28j60 board from ebay and I was going to make it work with atmega8 too! Yes, I’ve spent a lot of time myself, trying to make it work! Great tutorial!, I am trying to interface the same ethernet board with an Atmega 32, I have been trying to use tuxgraphics code with some modifications and finally yesterday I got it to ping something. I was looking at your code and got avr studio to build it without any problems! I want to try it later today with my project. Anyhow, I wanted to ask you if your code does display something in the LCD? because I wasn’t able to find the LCD files to look at, if not can you please tell me where am I supposed to write the piece of code for the LCD to display the ping count and all that info? I hope you can give me a hand! I have spent a lot of time lost with the ethernet board lol.. and I only have like a month to get my project working! Glad it helped, I myself had endless issues with the enc28j60, including porting the code from atmega8 to atmega168. A suggestion you might already be aware of, it is best to use the PB2 pin for the enc28j60’s CS! Thanks for your prompt response!… I was trying the second code you provided that’s why I didn’t find anything about the LCD sorry lol my bad!.. After trying the first code, I got it to work but only when I connected the ethernet module and a PC together with an ethernet cable. The problem I get is that when I try to connect the ethernet module directly to the internet and try to ping or access the webserver from another computer in the same network I don’t see any response. Can you tell me how are you intefacing the ethernet module to the internet? I mean do you have the ethernet module directly to the router? I have to admit I didn’t find a proper way to structure my articles so I can show both the original results and the new updates in an efficient way. Sorry for the confusion with the two versions. My enc28j60 is connected directly to the router with a normal, non-crossover , cable. What exactly do you mean by ” I try to connect the ethernet module directly to the internet ” and ” access the webserver from another computer in the same network” ? I’m not sure I understand the way your devices are connected. Is your enc28j60 using a static public IP? This is rare nowadays. I don’t think you’ll need to change the subnet mask, but instead make sure that both your enc28j60 and the work computer are in the same network, eg. both connected to the same Switch, and that your IPs are in the same class. Note that my code uses 192.168.2.24, that might need to be changed in your case. Yay!! I tried it in my house internet and now is working :).. it seems like at my university they have something that was blocking it from sending or receiving any packets.. but here it worked perfectly! Great. Good luck with that! Hi there !! Great project. Question: Where should I “plug” INT pin (buffered version) in Atmega8 ? In this configuration, is it possible to burn the Atmega via ISP? In the tuxgraphics version, I have had some problem with it. I think, it was because the 3,3V of the Atmega. Hey, really good work. Running fine on mine, now i’m just looking how to put a button or other stuff to control leds, etc… Do you have an idea ? You mean A button in the Web interface it exposes? i always error to ping my ethernet module..
1 – How can I create a Telnet server with it ? 2 – How can I create a UDP or HTTP client and send data into Internet (set Default Gateway for ENC28J60) ? I’m Sorry ! MY English language is very bad ! Just noticed your email in this read me file. Sorry to say, I can’t leave any comments on your website. However I left an offtipic comment to one of your youtube videos. The questions are if I need to use external crystal? what should be the fuses for atmega8? will your code (the networking part of it) be working without sensors connected. I built the second option (no buffer) on the breadboard and it doesn’t work. How do I know (without oscilloscope) where is the fault? I didn’t try it without external crystal, but I would say you should use one. The code will NOT work without the DS18B20 sensor, because there is a loop in the code where it waits for the sensor. What exactly do you need? I might be able to put a new code snippet for you. Please try to use the comments section, so others can benefit of our little chat. should it be working with ds1820, not ds18b20? Just tried it, and it does not 🙁 how many temperature sensors does it support? what are the fuses for the last code? L:xFF, H:0xC9? yep, the two leds are blinking from time to time. well, the green one is turned on, while the yellow one starts blinking actively at first and then it does blink from time to time. then the led stops blinking and tcpdump becomes silent. just five times. however, when I do broadcast ping, with each ping I get yellow led blink. it turns out I can observe this five time blinking in respond to any pings but for broadcast, which continues blinking always. Can you pls. upload a program without the loop for the sensors, only showing a simple welcome html page? I have some trouble with getting running the hardware, and related to your reply #23, it should be because of missing sensors. @Libra, I double checked the code attached at the end of the article. It doesn’t make any sensor readings although it contains that particular code. So what is attached there (webserver_atmega8) is a simple webserver, showing a welcome html and the number of pings. Don’t forget the IP is set to 192.168.2.24 , so make sure your network is configured correctly. Can you pls. check, what chip revision are you using? What is the value of the RBIAS resistor at your eth. module? I am just reading the datasheet documentating the revision of the ENC28J60 chips, and I see, that the first two revisions need 2.7KOhm resistor for RBIAS, and the last 2 need only 2.32KOhm resistor. I have bought my ENC modules 2-3 months ago and the chips on it were made around the 3Q/2012. At evening, I will check, if my eth. module is in corespondence with the datasheet. I think, it should be the problem of Serjio, too. But I have some problems with that. I try to use AVR Studio 5.1 with this project (my AVR Studio 4 don’t want to open project). First, what I do – i am changing device to ATMega32, than i check SPI interface (pins for MOSI,MISO,SCK,SS) in net/enc28j60.c. CS pin is connected to PC5. Than I program the microcontroller. and at least try to connect this module to my laptop with ethernet-cable. Green LED is turned on, yellow turn on/off from time to time. Windows XP detect, that it was something connected and tries to send packages, many pakages sent, but nothing returns. I also tied to ping ip adress (cmd says “request timed out”) or open it in browser, but it not works. where is a mistake? by the way, why atmega168 will only work with PB2? @pavel make sure you try all the three samples posted on this article. I have absolutely no idea, why it is not working. Yesterday I tried to read out the revision number of the enc chip, but I’ve got “0”. I think, the SPI is not working, but I do not know, why (same connection, as yours, Atmgea8A, same fuses, 16MHz crystal, connected only SI, SO, SCK and CS.). The last circuit diagram with the minimalistic connection – is there everything, what I need to get it working? Reset and INT is not connected? Every of the three codes works on the last circuit? I remember I had some issues with two of the blue enc boards I got from ebay. The solution was to re-solder the 25MHz crystals, as the original soldering was improperly executed. Can you send me a picture with your setup? MAybe this gives me some additional ideas that might help. @Florin, salut. Am patit si eu astfel de probleme, dar nu mi-am dat seama ce le cauzeaza. Acum folosesc in uRADMOnitor un Atmega328 care nu se mai blocheaza. Atmega8 se bloca destul de des. S-ar putea sa fie ceva legat de o alocare de memorie, dar nu am identificat exact probelma. 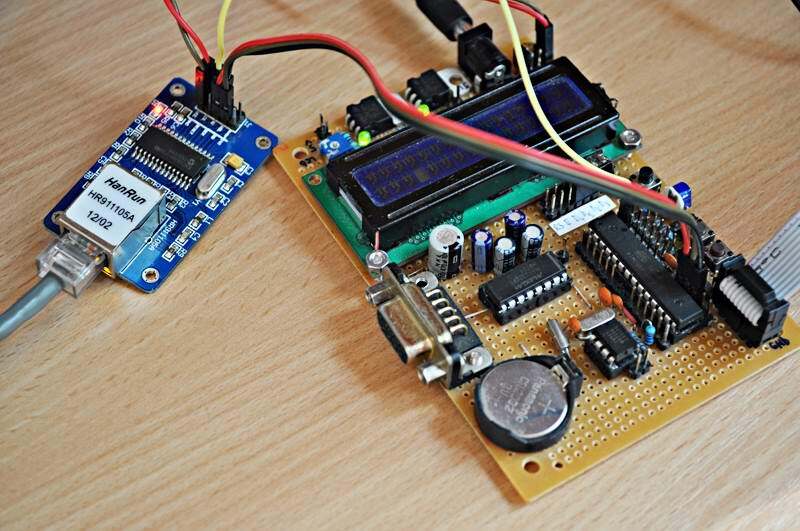 @Krzysztof, yes it is possible, see my uRADMonitor project available on this blog. @shrnvs , did you make any progress? @shrnvs: the code provided here should be use with the circuit presented. for other boards, you should make the adjustments, or contact the vendor of that board for the code. I’d like to know if you could use LM35 or other analog sensors to the board. i am using atmega32a also i tried PB2 but not worked. 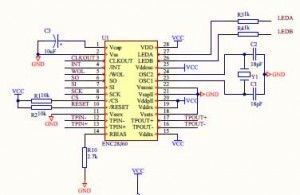 how can i get computer ip in avr ???? I have tried your code and I cant ping or acces webpage, I have tried to acess atmgea by router and directly by pc… eth cable should be crossed? Hi. No need to cross link. Instead you must make sure your IP is correct: either in the microcontroller or in your LAN configuration. hello, excuse me a question, compiler or program that you use???? Will the codes work with Eclipse IDE(Galilieo)?? @Raha I didn’t try but with the proper modifications you should get it going in Eclipse too. Thanks for the reply! I also wanted to know what exactly you mean when you say that “the mac and ip have to be unique in your local area network. You can not have the same numbers in two devices”??? Are you referring to the IP address of the mac here?? @katze: both your findings are correct. The rest should work unless you did something wrong. Ok, thank you, i will try today. And what about CS pin? Should i connect it to PC5 or PB2? Please, send me on my email your hex with this change (IP & MAC) if you can, because I have some problem with my AVR Studio (i have some warning, that atmega8 is not supported with something, i cant remember now). I want to be sure that software is ok. Thank you a lot for help! Can’t get it to work on my ATMega8-16PU :(.. Wired it up exactly as the scheme above (the most basic one) but couldn’t get it to work. Didn’t changed anything in the program. Hey radu, i’ve implemented your project with atmega128 and showed exactly like your screenshoot in my chrome. but now i want to build another project as a client, my purpose is to chat with simply server aplication (not web browser) in my PC and i confused with code do i need to change because in your project that you share the atmega is a server not a client. Yay got it to work! Great tut man, many thanks! Too bad the ATMega8 its memory is nearly completely full without any other code except the webserver..
Hi Radu, can you help me how to send data to micro controller ? Thanks a lot. Hi Radu, how to make uC receive data, not only send? Thanks for you help. How can I create a UDP or HTTP client and send data into Internet (set Default Gateway for ENC28J60) ? but i not found source code uradmonitor project!!! how to do? or where to download? or it all the same. hi Banec. Currently the uRADMonitor source code is not available, because I plan to release it as a commercial product. Maybe lay out some of the code from set Default Gateway for ENC28J60? Please update the code webserver_atmega8. yes or no update source code webserver_atmega8 ? Hello Banec. I’m not quite sure that I understand what you are asking. Please rephrase. Thanks. I need a default Gateway. access via the router from another subnet. Please update the source code webserver_atmega8 and add ip default Gateway. Banec, I don’t think I have such a code. You added GW in the uRADMonitor. You can move some code in webserver_atmega8? i have some problems with this project that i thought you could help me. i implement this code on an ATMEGA128. Hi Ali, it’s hard to put a diagnostic from what you’ve posted, my advise is to double check your circuit, this is not a critical one so if you made it correctly it should work right away. ok, i will check the connection again. but i did that over and over again. Мда чувак зажал код и косит под дурного. Я могу читать по-русски тоже. Извините за не в состоянии помочь вам. Может вы не хотите внести изменения? а не можете? Выше вы писали что внесли изменения в код uRADMonitor. т.е. библиотека enc28j60.c(h) должна быть совместима. проще говоря, вам нужно перенести два файла из проекта uRADMonitor в проект webserver_atmega8!!! Вы же автор? или нет? Помогая другим, на этом блоге мой подарок для сообщества, а не обязанность. Я уже говорил вам, что не имеют код, который нужно, и не имеют время, чтобы исследовать эту проблему. Как я уже сказал, извините за не в состоянии помочь вам в дальнейшем. The problem was in the hardware. now it is working. of course i was a little late for reporting this. sorry for that. anyway, i add some other sections to the web server, and write a complete html for it. now it is working like a control panel. I add some other url except the main url. the device’s main screen [specifications and some logos] are in the main url [192.168.1.120] and the sensors are in the ‘s’ url [192.168.1.120/s]. by adding an auto-refresh meta tag to the sensors html code  the page will refresh automatically, so it looks more like a monitoring panel. in other effort i will use buttons in html page to configure my device, by using POST method. I have a question: what you’ve done to the code, so it will work with 16MHz AVRs? and thanks for this code. With my circuit you are free to use any type of crystal you want. I used similar circuits with both 8MHz and 16Mhz crystals with good results. Feel free to post your control panel project code, if you feel like helping others that might need to do a similar thing. Its all works really great. Thanks a lot. But I would like to do such uC Device, that can be swithed throuth internet. Idea is – uC will be connect to Internet via ENC28J60. Than user can switch something via internet from another side of Earth. My quastion is – how can that will be done? How can I bind my uC-webserver with certain domain, for example http://www.example.com ?? А как сделать отправку информации с АТмеги на ПК без запроса определенной веб страницы? @zigler: Если вы не нуждаетесь в сервер, вы можете использовать сокеты или любые другие средства связи. простая прошивка, чтоб пинг был в локалной сети? I am trying to do a project using atmega16,8MHZ and ENC28j60 Module. I have tried with avrportal.com code..no success…what should i do to implement a TCPclient using Atmega 16 running on 8MHZ and ENC28J60 module. Please help i am stuck :(. Можно ли вместо веб.сервера реализовать веб.клиент для сети интернет? Т.е. чтобы была зозможность отправлять информацию на обычный apache web-сервер с помощбью метода GET ? На сайте http://tuxgraphics.com реализован и вебсервер и вебклиент. Я пробовал вебклиент (версию 5.3) товарища Guido Socher http://www.tuxgraphics.org/common/src2/article09051/, с платой как для Вашего вебсервера. Пока ничего не заработало. Подскажите, пожалуйста, какие значимые отличия платы товарища Guido Socher от нашего ENC28J60 module и вообще, какие могут быть отличия и трудности? does this solution work with stk600 and atmega2560 ? I cant get it done.. I am trying to run “basic webserver implementation” on an atmega8L-8pu and I want to know if I am taking the correct steps when programing the micro-controller. 3. Write the hex to the Atmega with avrdude. The problme is that there is no response to ping. What am I missing ? 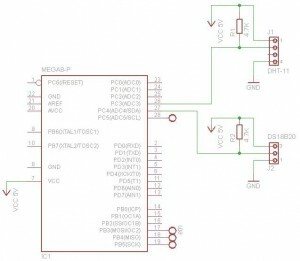 variable myip and mymac are represents to ip and mac of atmega8? or represents to ip and mac of my computer? My problem is the same as like Robert now. Please reply radu. For the mega8, you need to connect CS to PB2. I already explained this in the article. I compile it with avr gcc (fine). But when i run it i can’t ping it / acces it on webbrowser the router also don’t detect the device. Actualy i am debuging it by puting some “BEEP();” on the code for listen where it go or not. Actualy it go on the while(1) fine ! I am continuing debugging for know where it have a problem. . If someone as any idea .. I do a mistake* Actualy it’s working well in the code (enter in the while(1) infinites times, maybe i need to see before, why server isn’t started.. Did we have to configure something else than IP / mac ? Just make sure the IP fits your network’s settings. So now i want to understand … Did the enc28j60 cab be set only for a “range” of mac adress ? Or what did make the problem ? Did the router have a list of “know” mac adress ? Cyber, it’s not the ENC28J60, but your router that probably didn’t allow the previous MAC you’ve used. With this I am not able to get entered number into the variable Numbber(unsigned int). Always I am getting 0 for Numbber which is its initial value. Where I am making mistake? Please help. With this I am not able to get entered number into the variable Numbber(unsigned int). Always I am getting 0 for Numbber which is its initial value. Where I am making mistake? Please help. It seems in my earlier post complete code didn’t came. I was able to port the basic ATMmega8 Web server codes into ATMega32 AVR with a slight modification at port pins and it is fully functional. Thank you very much for sharing your know how with others.. 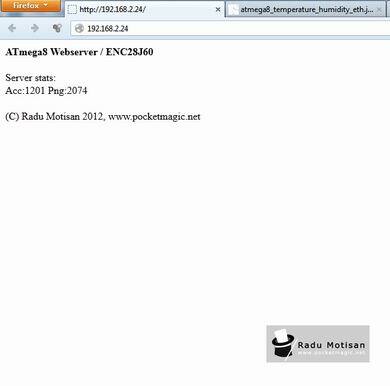 I came to your webpage containing the web server project with ATmega8 while I was working with the ENC28J60 module. I have tested your sample web server (the version without the buffer), then converted the code to C and found it working without any problem. It is true that the ATmega8 has very limited resources (only 1KB SRAM and 8KB Flash). However, I want to fully utilize the flash memory for storing webpages consisting of HTML and CSS. But apparently, the server cannot reply large webpages with size bigger than the size of the buffer (defined as BUFFER_SIZE in code). Can you shed some light on it? (i.e. How to send large webpages using the small buffer, probably by fragmenting ? Another thing that would be really helpful if it was possible to simulate the web server in the Proteus or other simulation softwares. Did you try? Te rog sa`mi steri comment-ul 120. Hi Radu i tried to compile this code by atmel studio. it’s compiled and and i programed it on my micro (low fuse bits: FF high fuse bits : d9). but when i try to ping it on my system (my local lan statics ip is :192.168.2.29) i got error. can every one help me ? Why are aou doing it in ISR? Can it be moved to main/while routine? Does variables for reading dht11 and ds18b20 need to be globals? Your ISR lasts pretty long, measure time for both those sensors is >1s. Thanks for your publication of Atmega8 with 28J60 interface. very well for PING request. I want to implement it as client to open TCP/IP socket on some port number say (example 8000). can you help me in this regard. thank you for perfect example. I port your web server example for newer chip ATxMega in new Atmel studio 6.2 with ASF. If you want, i can sent to you example project to publish on this web. Just reply for my email. @Jarda, that would be great. My email is under the About section of this blog. 1. Is there any way I can simulate ENC28J60 in Proteus ISIS? 2. Can I use the “ATmega8_ENC28J60_NOBUFFER_TEMP_WEBSERVER” project to communicate over the internet, or is it limited only to the ethernet? 3. And where can I get an explanation for the TCP/IP stack that is implemented for the in the file “ip_arp_udp_tcp”, cause I wanna learn the concepts behind it. ChangedTIMSK to TIMSK2, TCCRO to TCCROB, TIFR to TIFR0. Also, I cannot ping the module, I am using cross over cable directly to my laptop, do you have any suggestions? @nak, where is your CS connected? Try connecting it to PB2? Hi I am trying to do a similar project with the Atmega8515, will this code work with the Atmega8515? I tried your code webserver_atmega8 and I am still unable to ping the enc28j60 from my PC. -I connected the enc28j60 with MCU using SS to CS, MOSI to SI, MISO to SO and SCK to SCK. Привет У меня работает но медленно.идет несколько ping и ping не идет.я не использовал буфер. чём проблема? можете сказать как поставит fuse bits. Hi I have a few runs but medlenno.idet ping and ping can not idet.ya not use the buffer. What’s the problem? can tell how to put the fuse bits. Dear Radu, thanks for sharing such great work. you have made it very simple. I am trying to make your basic “webserver_atmega8” code work on “AtMega32” and need a bit of help. # network adapter in the laptop shows that it is connected to an unidentified network. On pinging: no response, only yellow light flickers when pinging is active. On Wireshark the laptop’s network adapter is constantly sending ARP packets but no response comes from the module. Any hint from you would be highly appreciated. Thanks. It’s hard to tell, but I’d try to hook it to a router just to see if there is any change in the ARP traffic. Nevertheless keep us posted on your progress. The CS Pin is ok (the PB2 is required for the atmega8 mostly), and so is the 8MHz frequency (I use this more as well). thanks for replying. that turned out to be a power supply problem. it is working fine now on atmega32. in my project i need a data logger device which will periodically update the server with the data. I have same functionality working with a WIZNET module which is very easy to work with as it has a hardwired TCP-IP stack. I´ve trouble with your solution. I connected all as your pictures show. I burned firmware to my ATMega8a with little changes (ip->192.168.1.24 and F_CPU -> 8MHz), but i cant ping it. System show 0 recieved packets, I´m connected directly to computer. Network adapter have this settings: static ip ->192.168.1.88,mask 255.255.255.0. Please help me, I´ve recheck all 100000x but i cant see any problem. if I could ask for a program code? I just wanted to learn microcontroller that can be connected to the internet. Hello Michal, did you connect CS to PB2(SS/OC1B) ? Strange. Well… at this point I’d consider some redundant hardware check. I´ve tested it with other atmega8 and 16MHz crystal and it doesnt work. Maybe enc mini board is faulty (I dont think so, but it is possible). I will buy another module from ebay and test it. GMD.d:1: *** multiple target patterns. Stop.